Spartite 2000 Mast Wedge Systemis designed for both race and cruise boats of any size. 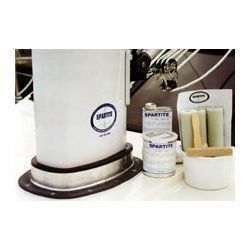 Spartite ensures secure and correct mast position in the partners all season, and makes correct placement of the mast in the partners automatic whenever the mast is restepped. When installed properly will radically reduce or eliminate leaking at the partners. Racers, who like to move their mast fore and aft to adjust to conditions, can pour Spartite to fix the athwart ship position of the mast and allow space fore and aft for quick, easy adjustment by the addition or removal of spacers. The Spartite one piece structure elimates the problem of wedges falling out or moving. Note:To estimate the quantity of SPARTITE needed, measure the square inch, or square centimeter, area of the mast section and subtract that number from the square inch, or square centimeter, area of the partner opening. Multiply this number by the desired depth, which must be at least 2" (5 cm), then add 1/4" (7 mm). If you purchase too little, a further amount can always be mixed and added later.